Pulpit makes reference to our religious culture that was so much more central to peoples lives than it is today. It also explores the juxtaposition and balance of internal and external issues, broadcasting , reflection, projection and assimilation. In the context of the surrounding landscape of Glenbuchat, Pulpit is a reflective space to contemplate memory, identity, roots and connections. Pulpit is situated outside Glenbuchat Hall facing Ben Newe. The audio soundtrack lists the names of the houses in the glen, spoken by voices of the people living in them. Thoughts, memories and reflections can be written in the ‘Book of Glenbuchat’. Pulpit is based on the wooden ‘Preaching Tents’ that were used as temporary pulpits for open-air services. In the period before the 19th century such tents were common, not least after the Disruption of 1843 when many Congregations broke away from the Established Church to form the Free Church of Scotland. At first, at this time of religious zeal, many congregations were church-less, hence the use of these portable ‘preaching tents’ . 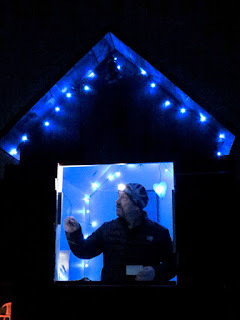 A Pulpit party was held Nov 2013 with bonfire, food and wine. Participants were invited to enter the pulpit to declaim for up to three minutes on topics of their choice. These included poetry, views on land management , thoughts on the nature of art, rants about over use of acronyms, cynicism in society, and many more. The declamations were a healthy mix of reflections and ranting, helped greatly by whisky. The Pulpit finally became the artwork it was intended to be that night !. Pulpit was built by Chris Tauber in Aug 2013. 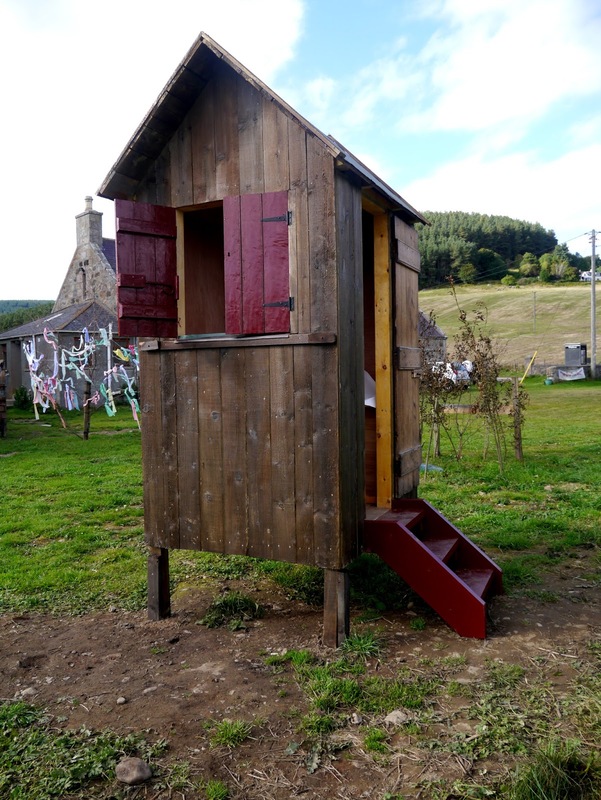 It was funded by Aberdeenshire council as part of Gill's Landmarks residency in Glenbuchat, Strathdon.